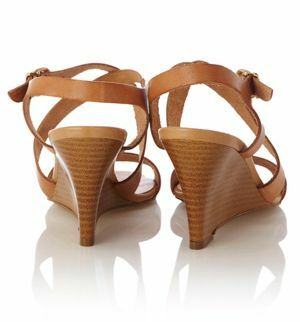 Do you remember when wedges were the clever alternative to teetering about in high heels? They were like the stabilisers of the shoe world. A little bit of height without the vertigo. Then something happened and my go-to running about wedges were ruined by over the top platforms. The platform wedge is not my friend. I live in fear that I'll run for a bus and snap my ankle like a Dime bar. Oasis must have heard my pleas and they've done the unheard of. They've designed a leather wedge that you can actually walk in. Madness. It's so simple it sounds bonkers. And £55 isn't a bad price to pay, either. The leather is gorgeous given the price. These shoes are keepers. I know that they don't look like they're anything special, but that's exactly what I like about them. They need nothing but a decent pedicure (I'm thinking canary yellow polish). No need for bells and whistles, just beautiful shoes you can walk in for more than two minutes. WANT!!! I can think of so many outfits they would go with. Pretty without being completely impractical. Went into Oasis to oggle the floaty skirt you put up from the other day and darn near bought these babies!! Oasis is niiiice this season!